Rebecca and I are thrilled to announce that we are expecting a baby...our third child. We are expecting an arrival date of early November. With all of the cat drama we've been dealing with, I haven't been able to focus on my writing, editing, or game design, but I did get one huge piece of news last week....my novel, Red Moon Rising, which I have been working on off and on for more than a decade, will be published by Sam's Dot Publishing, with an expected release date of Septemeber. The book centers around a young man trying to come to terms with the death of his brother, while at the same time trying to save the Earth from the ecological catastrophe it's facing. The book is set roughly 40 years in the future, and things have gotten very bad. The main character, Erik Singer, finds himself going up against a major corporation that has only one goal in mind...make as much money as possible, and don't worry about who gets hurt in the process (including Erik's brother.) Along the way, Erik is joined by an interesting group of associates, including the Native American activist Charlie Chases Crows. A few days after we lost K.J. things seemed to go from bad to worse. 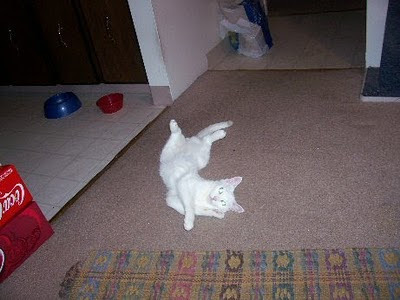 We realized that my cat, Mosi, was no longer eating or drinking and was declining very fast. Her symptoms seemed to suggest constipation (which can be fairly common in older cats...she's almost 11), so we began to treat that by force feeding and force watering, but that didn't help, and she continued to decline. We took her to the vet, and she determined that she had a lung infection with fluid on the pleura...plus she had a very high white blood cell count. A few possible diagnoses were just a severe infection, pancreatits, heart disease or cancer. The first two are treatable (usually), the last...not so much. Yesterday she started eating on her own, and she's spent most of today cleaning herself. She'd gotten quite dirty from all of the force feedings, and she was just too fatigued to do anything about it. She also has started acting a little more like herself today as well. She follows me around meowing, and she hisses and growls at Rebecca...this is all pretty normal for her. We still haven't seen her drinking on her own, and if she doesn't start before we go to bed, we'll have to infuse her with fluids again. Her breathing is also a still labored, but it's not as bad as it was. We still don't have a diagnosis, and we don't know if she's going to make it, but she does seem to be doing better...and that at least is giving us some hope. We're still trying to do our best to cope with the loss of K.J. It's amazing how much an animal can touch your life, but he really did. This is one of my favorite pictures of him. He loved to lay in my lap, and seemed to do it every chance he got. Everywhere we look around our place, we see things that remind us of him. Places where he'd lay, or play, or be K.J....which took a lot of work on his part, because he had a VERY unique personality. It's still very hard for us to believe that we lost him, especially since he wasn't quite 11. We always figured that we'd have at least another five years with him. It may sound strange to non-animal lovers, but because he meant so much to us, we've decided that when we buy our wedding bands in the next month or two, we're going to have both of them engraved with his name, that way he will always be with us in some way. Last night I had a very strange dream. In the dream, I woke up in the middle of the night having a lot of chest pain. Rebecca called the paramedics, and they rushed me to the hospital, but I died of a heart attack while they were trying to work on me. Quite surprising to my dream personality, I came back as a ghost in the hospital. I quickly left the hospital and headed home. As I came through our door (literally), I saw K.J. laying on the back of the couch in his favorite spot. I said, "Bubu," and he looked up at me with this expression that seemed to say, "You can see me?" I picked him up and hugged him close, but then we realized that Rebecca and the girls were devastated, and there was nothing we could do for them. A quick jump in dream time, and Rebecca and the girls were packing to move to Texas to live with her mom. As they were leaving, I picked K.J. up and carried him down to our van. We then rode with them all the way to Texas so that we could be with them. Last night our beloved cat, KJ, passed away. It was sudden and completely unexpected. We're still not sure what happened, and we're both completely devastated. KJ would have been 11 this April, and Rebecca has had him since he was just a couple of months old, so he was a huge part of our family. Bubu, as he was also known, was a very friendly cat. 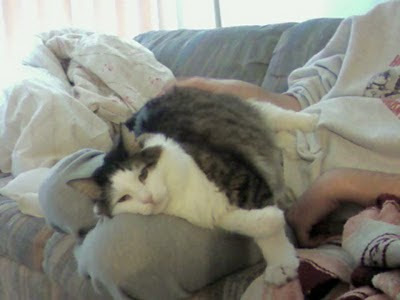 He loved to play with people, and he was always more than ready to curl up on someones stomach or on their lap. Every morning when the alarm would go off, he would come into our room and jump up on the bed, and then proceed to lay down on Rebecca so she couldn't get up. Whenever she'd be eating cereal, he'd sit and watch her, and as soon as she would put the bowl to her lips, he'd jump onto the couch cushion next to her, raising his paw in anticipation. Because he always knew that the last couple of drops of milk would be for him. When she'd get home from work at night, he'd be ready to play, knocking toys over, biting elbows, and generally acting like a kitten. No one would have guessed his age, and we certainly wouldn't have guessed that he was sick in any way. He would always sleep in some of the funniest positions, and a lot of our pictures are of him sprawled on his back, or curled up in a way that would look awkward even for a cat. Whenever we'd get home from the store, we'd always have to put the bag with the bread up on the counter, because if we left it on the floor, he would try to sneak over and bite his way into it. He had a thing for bread. There were many times when I'd be working at the computer, just as I'm doing now, that he'd come in and sit down next to my chair. He'd then reach up with his big white paw and pull on my arm until I'd reach down and pet him. Once he was satisfied with the petting, he would either lay down next to my chair, or he'd jump up into my lap...either way, you could hear his purr from several feet away. For those SF fans in the Denver area, I've been asked to speak at the April meeting of DASFA. I'll be talking about writing science fiction as well as editing, and of course, I'll be talking quite a bit about the Ephemeris RPG. The meeting will be April 17th at 7:00 pm at the Whole Foods Market at 1111 South Washington Street in Denver. I hope to see quite a few of you there. The first week of February has been a crazy one. We finished up our wedding invitations, and got those sent off on Thursday. We probably could have come up with more than 100 people that we would have liked to invite, but with money being what it is, we had to cut that list down quite a bit. Of all the planning we've done so far, I think deciding who had to be there was the hardest thing yet. Sunday will be our youngest's 5th birthday, but because Rebecca doesn't want to take vacation time (saving that for the wedding and honeymoon), we had to take her to her birthday movie on Thursday and then we had her party last night. We went to see "The Princess and the Frog," which overall wasn't that great of a movie...but it was nice for the girls to see a princess of color. Our oldest has some self-esteem issues about her racial background, so hopefully these kinds of things will help. The youngest seems to have gotten the idea that now that she's five, she's some kind of princess and has been quite a handful behaviorally, so we need to convince her she's not before she starts kindergarten in the fall. I mentioned this on my Facebook, but I also wanted to mention it on my blogs as well. I'd like to extend a thank you to Karen Newman of Afterburn SF for nominating my story "Forgive Men their Trespasses" for the 2010 Million Writers Award. It looks like it might be a bit of a literary award, so the odds of a genre story doing well might not be that good, but I certainly do appreciate the nomination. If you're interested in reading the story, you can find it at http://www.afterburnsf.com/ViewArticle.aspx?ArticleId=29171e81-5511-46dd-b860-fa263a1bb2f0. The story is set in the same "world" as my novel, The Opium of the People, which can be found at http://www.amazon.com/dp/1419625888.